commented on "Banquette Seat with Timber look Tables on each End." Banquette Seat with Timber look Tables on each End. You think it! We make it! 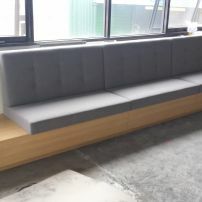 We can make all sorts of banquette styles and combinations. Just send through your details and what you would like us to quote on. We will get back to you as soon as possible.